President Obama has recently cited intelligence failures as the reason America was taken by surprise by the rise of ISIS. The intelligence community has not been happy with this statement. The U.K. Daily Mail reported yesterday that President Obama has had accurate information about the rise of ISIS since before the 2012 election. The problem is that since ISIS is nothing more than a reconstitution of Al Qaeda, an organization which the Obama Presidential campaign claimed had been destroyed during the first presidential term of President Obama. Therefore the threat was ignored publicly. It was evidently also ignored privately. Breitbart.com reported yesterday that according to the Government Accountability Institute (GAI), President Obama has attended only 42.1 % of his daily intelligence briefings (through September 29, 2014). This information came out after President Obama blamed Director of National Intelligence James Clapper for intelligence failures related to ISIS. …Ultimately, as ABC News reported, the White House did not directly dispute the GAI’s numbers but instead said Obama prefers to read his PDB on his iPad instead of receiving the all-important live, in-person briefings. As Woody Allen once said, “Eighty percent of success is showing up.” I think we need a commitment from our President to attend intelligence briefings. Reading something on your iPad is no substitute for hearing an intelligent discussion of a subject. Here is the link to Prime Minister Netanyahu’s speech at the United Nations. …In the past, outrageous lies against the Jews were the precursors to the wholesale slaughter of our people. But no more. Today we, the Jewish people, have the power to defend ourselves. We will defend ourselves against our enemies on the battlefield. We will expose their lies against us in the court of public opinion. Israel will continue to stand proud and unbowed. Ladies and Gentlemen, Despite the enormous challenges facing Israel, I believe we have an historic opportunity. After decades of seeing Israel as their enemy, leading states in the Arab world increasingly recognize that together we and they face many of the same dangers: principally this means a nuclear-armed Iran and militant Islamist movements gaining ground in the Sunni world. Our challenge is to transform these common interests to create a productive partnership. One that would build a more secure, peaceful and prosperous Middle East. Together we can strengthen regional security. We can advance projects in water, agriculture, in transportation, in health, in energy, in so many fields. I believe the partnership between us can also help facilitate peace between Israel and the Palestinians. Many have long assumed that an Israeli-Palestinian peace can help facilitate a broader rapprochement between Israel and the Arab World. Thank God for a leader who tells the truth. The Corner at National Review is reporting today that The New Georgia Project, currently under investigation for “significant illegal activities” regarding voter registration in Georgia began handing over subpoenaed documents on Friday. The group claims that it has reached an agreement to limit the scope of the documents it’s required to turn over. However, Georgia secretary of state Brian Kemp, who began this investigation earlier this month, has no knowledge of any deal to limit the scope of the documents to be handed over. Georgia secretary of state Brian Kemp launched the investigation of the New Georgia Project earlier this month after receiving “numerous” complaints regarding applications submitted by the group, including forged signatures and applications. The investigation has turned up 33 fraudulent applications thus far, ahead of the thousands of pages of documents set to be turned over. The group is run by a close ally and campaign confidante of Democratic Senate candidate Michelle Nunn, state-house minority leader Stacy Abrams. Do you ever wonder why most Democrats oppose voter identification? Below is a short video about the new Advanced Placement United States History (APUSH) course. You may be surprised to know what your children are being taught. Are Americans Willing To Connect The Dots? Breitbart.com posted an article today about the beheading of a woman in Oklahoma on Thursday. The beheading may be an ‘isolated incident in the workplace (aka ‘workplace violence’), but the connections of Alton Nolen cause me to question why he was not being carefully watched. One of Aesop’s Fables ended with the statement, “You are known by the company you keep.” So what company was Alton Nolen keeping? The former leader of the Islamic Society of Greater Oklahoma City, a group attended by Alton Nolen, was Imam Suhaib Webb. Imam Webb is now employed by the Islamic Society of Boston. The Islamic Society of Boston, which was attended by the Tsarnaev brothers during his tenure as Imam, has several within their ranks who have been charged with committing acts of Islamic Radicalism. The founder of the Mosque, Abdulrahman Alamoudi, was sentenced to 23 years in prison for his role for financing terror. After the Boston Marathon bombings, Webb had initially been invited to an interfaith memorial at the Holy Cross Cathedral, where president Obama was scheduled to speak. Imam Webb’s invitation was then rescinded under mysterious circumstances at the last minute, according to reports. It really is time to put FBI informers in Mosques to see what is being taught there. I realize you can’t arrest someone who hasn’t actually committed a crime, but there ought to be a way to stop radical Islamists from sharing their poison in the United States. If they are not citizens, they should be sent home. If they are citizens, they should be charged with plotting against America. Eric Holder is expected to resign later this afternoon. The contempt of Congress case against Attorney General Eric H. Holder Jr. — the first sitting Cabinet member ever to face such a congressional rebuke — will continue even after his resignation takes effect, but it’s unlikely he will ever face personal punishment, legal analysts said Thursday. Mr. Holder, is expected to announce his resignation later Thursday, and Tom Fitton, president of Judicial Watch, said the timing is not accidental: A federal judge earlier this week ruled that the Justice Department will have to begin submitting documents next month related to the botched Fast and Furious gun operation in a case brought by Judicial Watch. Judicial Watch has done an amazing job using the Freedom of Information Act (FOIA) to stop the stonewalling by the Obama Administration on Fast and Furious, the IRS scandal, and the Benghazi attack. Judicial Watch has used FOIA to get documents that the Obama Administration was not releasing to Congressional oversight committees. Eric Holder has turned the Justice Department into a political arm of the Democratic party. It is no longer the neutral department it is supposed to be. Unfortunately., his replace will probably continue that policy. Hopefully our next American President will return the Justice Department to its original mission–providing equal justice under the law. Yahoo.com posted an article yesterday about President Obama’s speech at the United Nations. The article pointed out how the President spun the statistics in order to paint a picture that was not entirely true. I don’t know if the listening audience at the United Nations believed what the President said or not, but President Obama obviously has a very casual relationship with the concept of truth. On Monday, some members of the Coastal Carolina Taxpayers Association (CCTA) attended the NC Academic Standards Review Commission’s First Meeting. …the meeting room was very crowded. It was also hot, and uncomfortable. CCTA’s Common Core Committee with Kim Fink, our Chairman, was in attendance. Unfortunately, it appeared to us that the review committee had been stacked with supporters of Common Core, although it was clear that some of the members definitely want the standards adopted to be North Carolina Standards. Senator Jerry Tillman made an impassioned statement that the US Constitution left eduction to the people and the States by not directly allocating authority for education to the federal government. He also said that the “bar must be raised” because NC’s children need to compete in national and world economies and that our top quarter of school graduates were not fairing well in competition with other states and the rest of the world. Senator Tillman said the General Assembly would not stand for a re-hash of Common Core, but expected the review committee to do its job and develop North Carolina Education Standards which he said would drive curriculum, something proponents of Common Core deny. It is up to parents and grandparents to get involved in this battle against Common Core. Common Core is not good for our children and needs to be stopped. The curriculum related to the standards is not the only problem–Common Core involves data mining of personal information on our children and grandchildren with no guarantee of the security of the data. It needs to be stopped. Today’s Daily Caller posted a picture of President Obama returning the salutes of the Marines on his U.S. Marine Corps helicopter in New York with a coffee cup. That is a serious breach of military etiquette. “President Obama just landed in New York for #UNGA2014,” says the caption. The salute is “the most important of all military courtesies,” says a manual for Marine Corps officer candidates. If the President had a better understanding of what it takes to become a Marine, maybe he would show them a little more respect. The picture in the article makes me want to send President Obama to Marine boot camp on Parris Island so that he would understand the character and quality of the men saluting him. He is a disgrace as the Commander-in-Chief. We have all heard about the good things that are happening in Texas–the state economy is booming, the population is growing, laws have been passed to encourage businesses to relocate there (and businesses are relocating there). Well, Texas has done something else right–it has rejected the Advanced Placement United States History (APUSH) Curriculum put out by the College Board. I recently posted an article detailing a few of the ideas put forth in APUSH (rightwinggranny.com). Yesterday a website called education views.org posted an article detailing what the State of Texas has done with APUSH. Texas is regarded as the state that sets the standard for textbooks across the nation. Texas has decided that the curriculum standards adopted by the elected members of the SBOE (State Board of Education) will prevail and that the College Board (a private entity that is totally aligned now with the Common Core) will not be allowed to dictate its biased and revisionist curriculum to Texas students. The free enterprise system and American exceptionalism will prevail in Texas, and many other states are expected to follow Texas’ example. Please follow the link to the article to see the videos of the testimony of Larry Krieger and Alice Linahan as they testified before the SBOE. RESOLVED, That upon approval of this resolution the Texas State Board of Education shall deliver a copy to the Governor, Lieutenant Governor, and Speaker of the House. Thank you, Texas, for showing America how to deal with APUSH! I am all in favor of teaching our children tolerance. It’s a really good idea for children to learn to accept people who are different from them in some way. However, there is a point where the search for tolerance becomes intolerant. Breitbart.com recently reported that California State University has ‘derecognized’ the InterVarsity Christian Varsity fellowship as a campus organization on all 23 of the schools in the state system. So what is the problem? On its website, IVCF states its “chapter leaders are required to affirm InterVarsity’s Doctrinal Basis,” which essentially recognizes God as the Creator of all things who exists in three persons, the Father, Son, and Holy Spirit, and the Bible as having been divinely inspired. In other words, in order to lead the organization (which is a Christian organization), leaders have to affirm that they are Christians. The Christian group goes on to say that in August of 2013, new chancellor, Timothy White, granted religious groups a one-year exemption for the 2013-2014 school year, but has since affirmed that no further exemption will be made. No campus shall recognize any fraternity, sorority, living group, honor society, or other student organization that discriminates on the basis of race, religion, national origin, ethnicity, color, age, gender, marital status, citizenship, sexual orientation, or disability. The prohibition on membership policies that discriminate on the basis of gender does not apply to social fraternities or sororities or other university living groups. Student organizations shall deliver to the vice president for student affairs or his/her designee a statement signed by the president or similar officer of the local student organization attesting that the organization has no rules or policies that discriminate on the basis of race, religion, national origin, ethnicity, color, age, gender, marital status, citizenship, sexual orientation, or disability. This statement shall be renewed annually. According to this logic, any organization that requires its leaders to follow a certain set of guiding beliefs would also be ‘derecognized’ at California State Universities. Stetzer (Ed Stetzer, writing at Christianity Today) states that, of course, the university may argue it is not banning or persecuting Christians. Stetzer said Greg Jao, IVCF National Field Director & Campus Access Coordinator, told him that, specifically, “derecognition” means the group loses free access to university rooms, costing the organization’s chapters $13,000 to $30,000 per year to reserve rooms, access to student activities programs and student fairs, and stature when the group engages faculty, students and administrators. I wonder if Muslims are subject to the same rules? Do leaders of black organizations have to be black? Does the leader of the art club have to have some basic art ability? Does the leader of the music club have to be musical? This is intolerance in the name of tolerance. ABC News reported yesterday that three Afghan military officers who were in the United States for a joint military mission have disappeared on Cape Cod, Massachusetts. They arrived in the country on Sept. 11, and were reported missing by base security personnel late Saturday. They were last seen at the Cape Cod Mall in Hyannis, Mass. Base and local police and state authorities are working together to locate the three Afghans. There are still approximately a dozen Afghan soldiers still participating in the exercise, which ends Sep. 24th. …Just last weekend, two Afghan policemen in the Washington, D.C., for a DEA training program at Quantico, Va., also went missing while on a sightseeing trip to Georgetown. The two men, who were part of a group of 31 Afghan police officers in the U.S. for the multi-week program, were found safe somewhere outside of D.C., but officials would not say exactly where, ABC affiliate WJLA-TV reported. According to WJLA-TV, the DEA said the two men left the group because they did not want to go back to Afghanistan. The term ‘green on blue violence’ is used to describe attacks on our soldiers in Afghanistan by people our military is training to defend the country. The fact that this phenomena has a name is an indication that these attacks are not isolated events. So why are we inviting Afghans to America when there are trust issues with Afghani forces? This makes no sense. WCVB is reporting that that the three Afghani officers have been found. The three missing Afghani soldiers who went missing during a training exercise at a Cape Cod military base this weekend have been found, a high-level law enforcement source tells Team 5. …The source tells Team 5’s Karen Anderson the men were taken into custody at the Rainbow Bridge Canadian/US border crossing near Niagara Falls on Monday. They were identified as Major Jan Mohammad Arash, Captain Mohammad Nasir Askarzada and Captain Noorullah Aminyar. “They were here for a multi-national military exercise which had been scheduled for a long time. They have been here for a couple of weeks. There’s a lot of speculation that within the military they maybe be trying to defect,” Deval Patrick said. On Monday, The Daily Signal posted an article about President Obama’s legacy. It’s something that the press has not really highlighted. 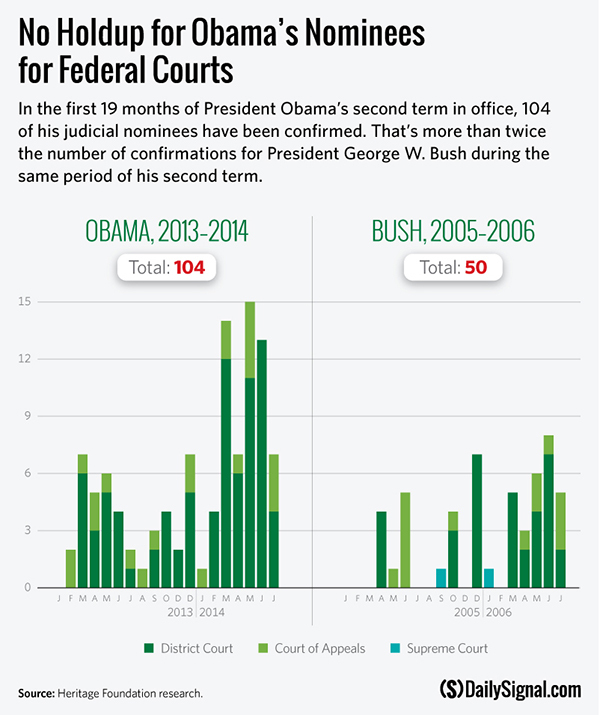 In President Barack Obama’s second term, the Senate has confirmed more than twice the number of judicial nominees than were confirmed in President George W. Bush’s second term. This is due mostly to the fact that Senate Majority Leader Harry Reid, D-Nev., succeeded in eliminating the filibuster for judicial nominees (excluding the Supreme Court, at least for now) in November 2013.. I am not a big supporter of the filibuster, but I am also not a big supporter of stacking the courts with judges with a political bias. That is what has been going on. Since many of the problems with ObamaCare will be decided in the courts, the Obama appointments to the lower courts could easily move America further to the left than Congress would have been able to do. Our Constitution was designed to create a representative republic. The idea was that laws would be made in Congress. People could hold their Congressman accountable and vote him out of office if they did not like the laws he supported. (Actually, that is not totally true. Initially, the House of Representatives was elected by the people, and the Senators were appointed by the state legislatures. In 1913, Congress passed the 17th Amendment, which called for the direct election of Senators. Up until that point, the state legislature could recall their Senator if he was not supporting bills that were in the interest of their state. The direct election of Senators changed the balance of power in the U.S. government and seriously diminished the power of the states against the much larger federal government.) Unfortunately, we have now reached a point where our courts are making laws. As the courts lean left, we may find ourselves living in a country with a very different form of government than what the Founding Fathers envisioned. …I reject this aspiration. I think this manic desperation to endlessly extend life is misguided and potentially destructive. I would agree that extending a life indefinitely with machines is a questionable activity. However, it is obvious from these statements that Ezekiel Emanuel does not appreciate life as a specific value–he values life according to what it can do. He seems to forget that we are called human beings–not human doings. Our value is in the fact that we are created in the image of God–not in what we can or cannot do. It is my belief that God is in charge of life and death and we tread on dangerous ground when we as people try to take those matters into our own hands. Unfortunately, ObamaCare reflects Mr. Emanuel’s point of view–not those of the Judeo-Christian nation that was America at its founding. Twisted logic in American foreign policy is nothing new. It has been going on for at least the last half century. However, every now and again it just seems to become even less logical than normal. Andrew McCarthy posted an article at National Review Online today about America’s alliance with the ‘moderate’ Muslims of Saudi Arabia. Admittedly, the Saudis have been important allies on numerous occasions–they have supported the use of the American dollar as the preferred currency in trading oil, they have been a strong enough member of OPEC to keep America from being totally raked over the coals in the oil price negotiations of that organization, and generally they have supported America when it suited their interests. However, there is another side of the story. Are we really sure that we want to continue our support Saudi Arabia? They are the main supporters of Wahabi Islam. Saudi Arabia supports schools in America that use textbooks whose map of the Middle East does not include the country of Israel. One of the things that puts America in the position of almost having to support Saudi Arabia is the current government energy policies. Energy independence would allow America to make decisions in the international realm based on reality–not energy dependence. American foreign policy has stopped supporting the interests of America.